A croupier named Roxy takes centre stage in Casino Charms, a 6 reel, 80 payline video slot from Playtech. Highlights here include the streak-style respins where the top paying symbol and wild are held. Spin the bonus wheel for up to 25 free spins, up to 15 free spins with stacked wilds or 8 streak respins. Stakes start at 20p, rising to £500 per spin. There’s a glossy, high spec look to the design in Casino Charms. With the bright lights of Vegas in the background, you’ll see playing card suits spinning around the reels alongside bars, poker hands, casino chips, dice, lucky 7s and diamonds. Croupier Roxy is the top paying symbol. A payout of 10 times your bet is on offer if you land 6 in combination. The configuration of those reels is a little unusual. They appear 3, 4, 5, 6, 7 and 7 symbols high. 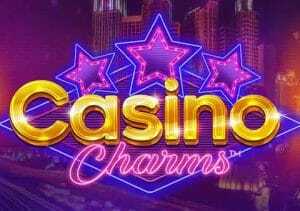 There are 3 features rounds on offer in Casino Charms. Roxy Respins feature – fill all 3 positions on reel 1 with Roxy and you’ll trigger this streak-style respins round. The symbols from reel 1, plus another other Roxy or wild symbol on view on the triggering spin is held. You’ll then receive 2 respins. Each Roxy or wild symbol that lands is also held. A final payout calculation is made after your 2 respins with all the extra wilds and top paying Roxy symbols in play. You can expect to land the Roxy Respins more regularly here than in the base game from the free spins. Landing 3 Bonus symbols results in a retrigger. We were pleasantly surprised by what we found in Casino Charms. The visuals are simple but nicely done and there’s a good selection of extras on offer. We hit the Roxy Respins feature regularly but found the Bonus Wheel much more difficult to land. The extras on offer can make it worth the wait though. This theme has proved a tricky one for video slot developers. Playtech has made a pretty good go of it in Casino Charms. They also offer you 100s of quality games with Age of the Gods still my favourite to date.